But prices, especially for good quality filament, did not really drop. Although we are witnessing a rise in competition between industrial filament producers, which in the long term should result in more mass production and overall lower prices, filament prices still hover around 22-30$ per 1kg spool. You even pay up to 50$ for 500g of specialty filament. These prices are so high partly because manufacturing and selling filament is a very lucrative business. This is where home or desktop filament extruders come into play. Some cunning makers/inventors have been developing a way for private individuals to produce their own 3D printer plastic at home, at only a fraction of its retail price. In fact, they developed a so-called “filament extruder” for home use, i.e. a machine capable of spewing out plastic filament which you can afterwards use in your 3D printer. 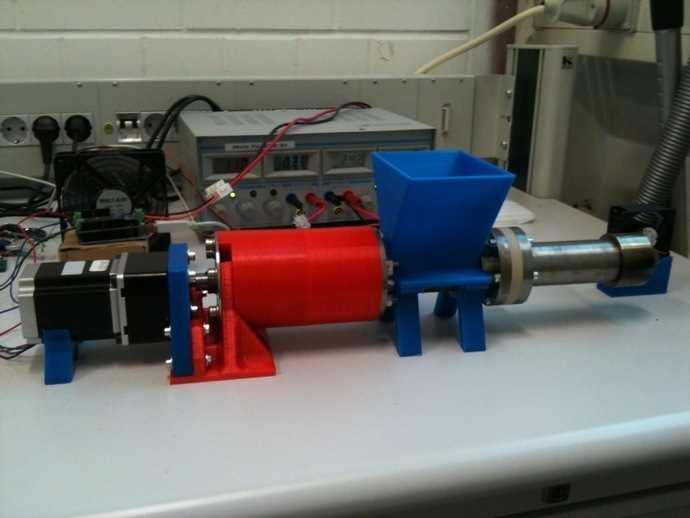 The photo below shows you how such an extruder looks like. The machine depicted in Photo 1 is the Noztek Pro, a sleek desktop-type extruder from the United Kingdom. Let’s have a quick look at these machine’s working principles before analysing the filament production process as well as raw material prices. The Illustration below gives you a simple overview on the common working principles of a standard desktop-type filament extruder. 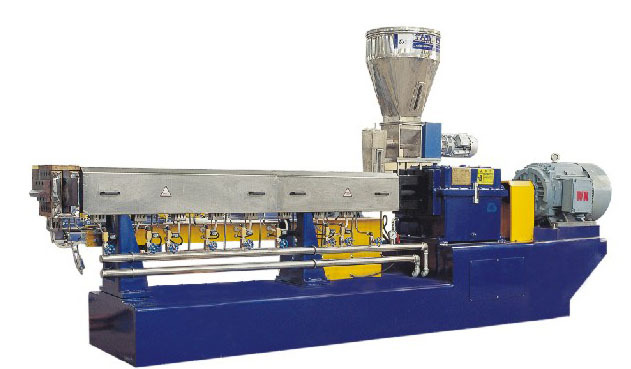 The main part of the extruder is a barrel containing a screw (also sometimes referred to as an “auger” or a “drill”), which is connected to a heater (or heat chamber or heat element) towards its far end. 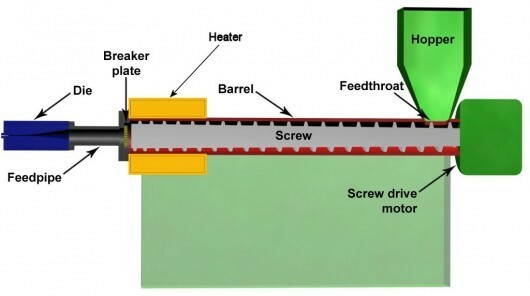 On the other end, the screw is connected to an electric motor which will, via mechanical action, transport the so-called resin pellets (cf. Photo 9 below) through the barrel towards the heater. Pellets are gravity-fed continuously from a hopper (a kind of feeding funnel). 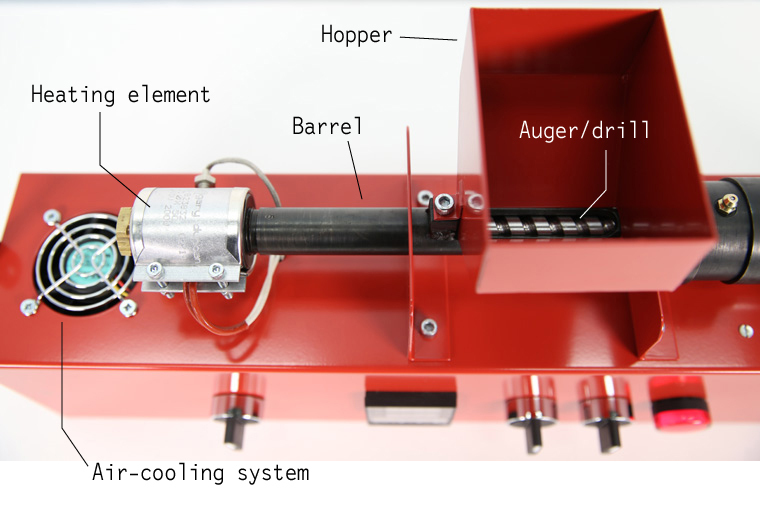 As the motor is continuously driving the auger, the resin pellets are pushed into the heater. 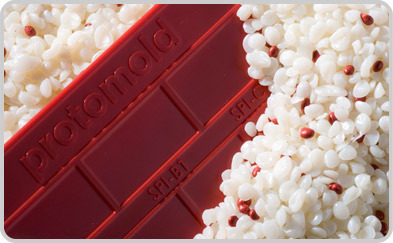 The thermoplastic pellets will soften and melt because of the heat and are then pushed mechanically through a die. Pushing the soft thermoplastics through the die will cause it to form a continuous filament strand with the diameter of the die. 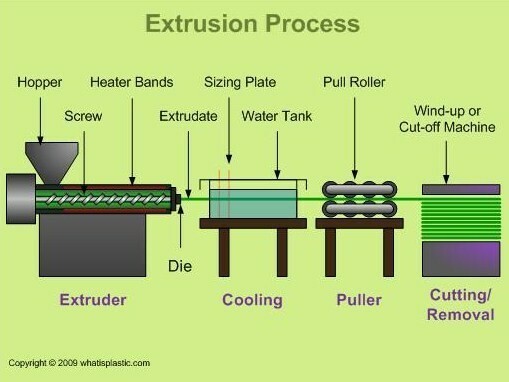 This process is called extrusion, hence the term “extruder”. Photo 3 shows you some of those parts in more detail. But there also are a lot of differences between extruders. 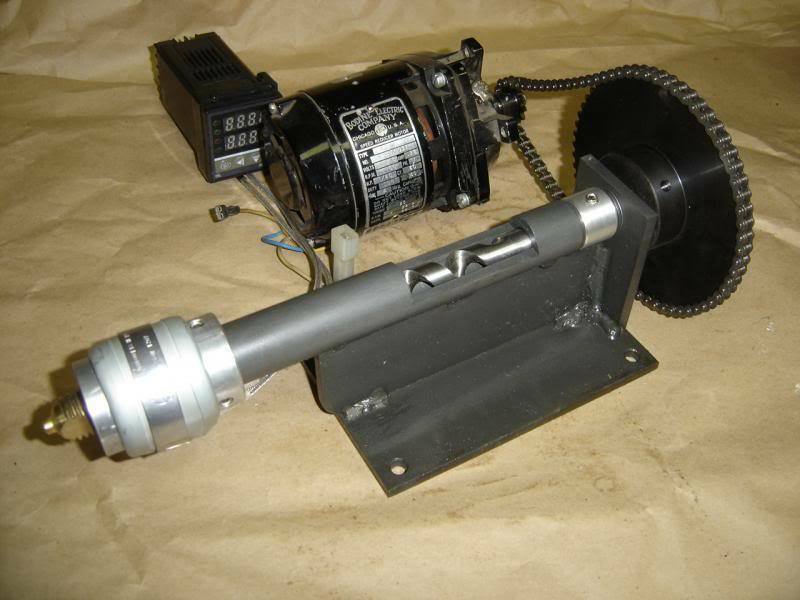 Some use bigger motors in conjunction of a gear drive system, others use stepper motors driving the auger directly. Most extruder types permit the interchanging of dies between the two standard sizes for 3D filament, either 1,75mm or 3mm. 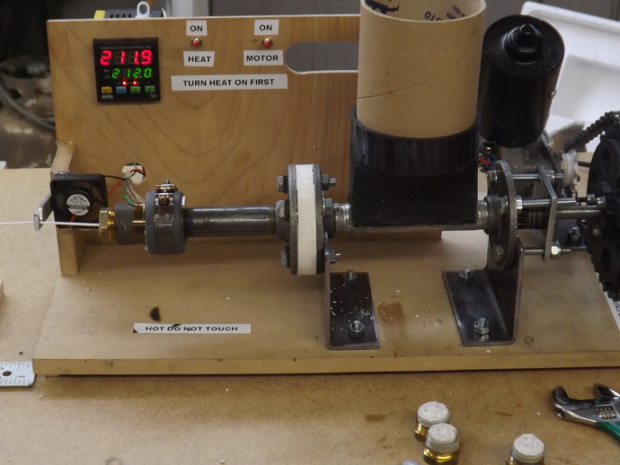 Some have an air-fan cool-down mechanism, others don’t, some even have an automatic winding system in order to wind the extruded filament onto a spool. Regarding electronics, some permit a very detailed temperature setting, others are just very basic. Just have a look at the photos below, showing many different extruder types. But rest assured, their basic working principles are always the same. As you see from the above examples, most of the commercially available extruders for home extrusion are kits, which need to be assembled by the buyer. Although Illustration 2 above may give you some ideas on how the different parts look like, we like to give our readers a real hands-on experience. 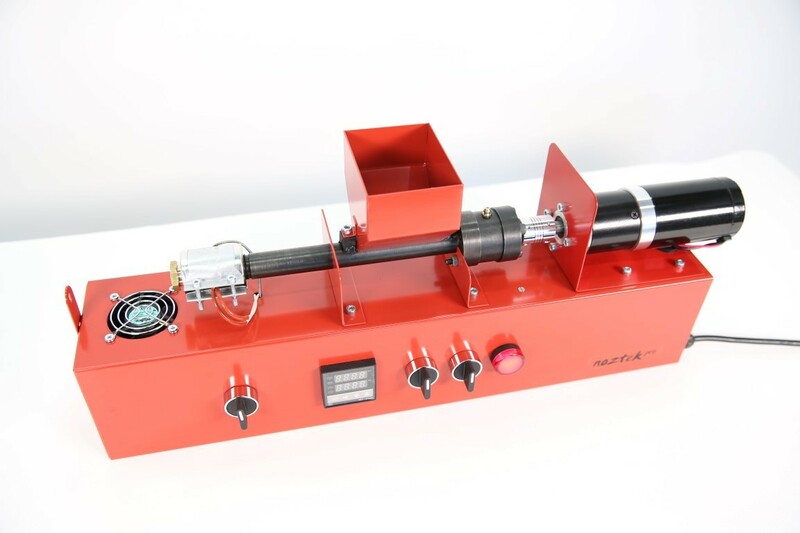 We will therefore use the sleek and ready out-of-the box extruder from Noztek, in order to identify most of the different working parts of such a machine. After having explained the basic working principles of an extruder, let’s now have a look at the filament extrusion process. 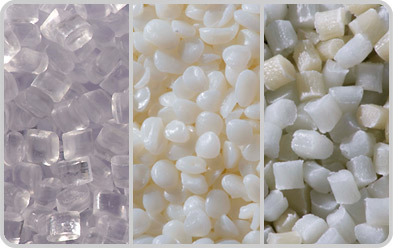 Filament is extruded from so-called “raw resin pellets”. Photo number 9 gives you a good example of what these pellets look like. Note that the pellets in this photo are destined for injection molding and made from materials which may not be suited for 3D printing – if you want to purchase pellets for extruding filament at home, you need to look for pellets suited for extruding and not those for injection molding. If you are not sure about which type of pellets you are about to purchase, just drop a mail to the manufacturer or wholesaler who can help you on this matter. These resin pellets (i.e. 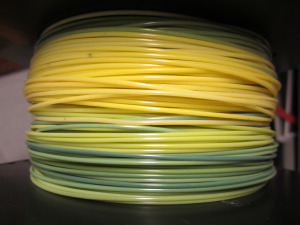 the filament raw material) are normally white or transparent and only a few millimetres in size. 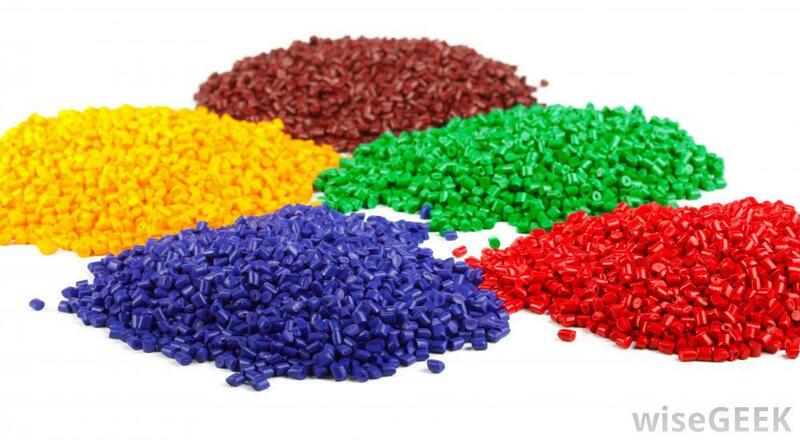 They are to be mixed with a so-called “masterbatch”, which are specialty pellets used for coloring plastics (aka a “color masterbatch”) or imparting other properties to plastics (i.e. an “additive masterbatch”). Color masterbatches are concentrated mixtures of color pigments encapsulated during a heat process into a carrier resin which is cooled and then cut into granular shape. Have a look at Photo 10 to get an idea what such color masterbatches look like. As color masterbatches contain concentrated color pigments, you only need to add a small amount of the masterbatch to give color to a whole kilogram of raw resin pellets. 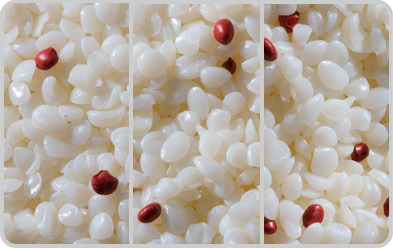 Photo 11 shows raw pellets, mixed with some masterbatch pellets, in order to obtain a cherry red color, whereas Photo 12 pictures different ratios of adding masterbatch pellets, in order to obtain lighter or more saturated colors. So, by adding one specific masterbatch color to raw resin, one can create filament of that specific color. But you can also create new colors by mixing different color masterbatches – in order to know exactly which color you will obtain, be sure to check the manufacturers recommendations and google the terms “mixing colors” or “primary color chart”. We also recommend that you do your own research, while taking notes on masterbatch ratios used and results obtained. Once you have found nice colors or made tests on what mixes well, we encourage you to publish those results, as information is still quite sparse on the Net regarding ratios and specific masterbatch reviews. 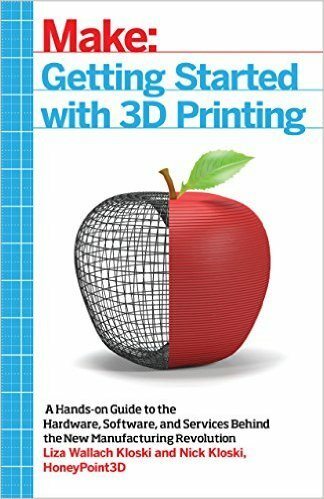 Alternatively, you can drop us an email at info[at]3dprintingforbeginners.com, we will publish your findings on our site. Why is information on masterbatch mixing ratios and general extruding recommendations still quite sparse on the Net? Well, filament extrusion at home is quite a novel concept, but with time, information will most likely multiply. But we definitely recommend reading David Smith’s excellent blog called Bits into Atoms , especially his articles on Masterbatch mixing and on Masterbatch ratios. [EDIT: it looks like David Smith’s blog has been offline for some time now. You can still find the Masterbatch ratios on the WayBackMachine here.] 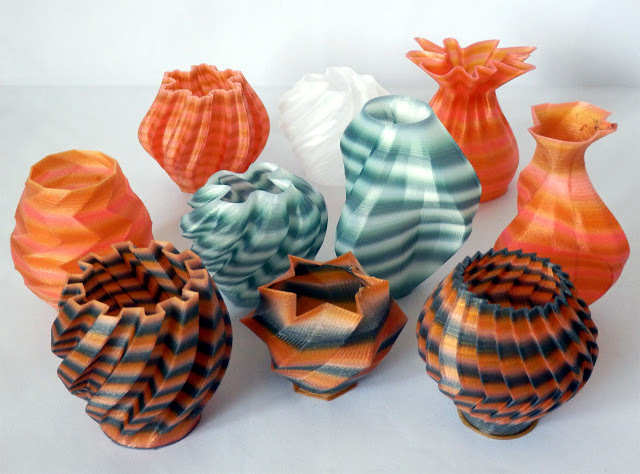 Have a look at what cool color variations David has managed to achieve with his Filastruder extruder, as well as the cool objects such a multi-colored filament can create. 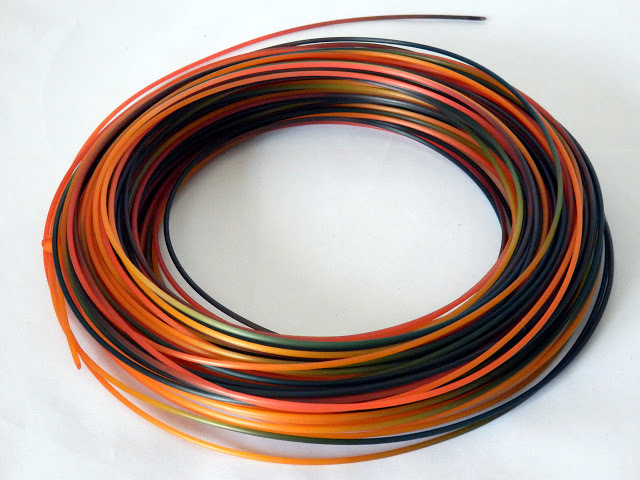 You also have other alternatives to extruding multicolored filament, like the solution Richard Horne, a.k.a. RichRap from http://richrap.blogspot.com came up with. 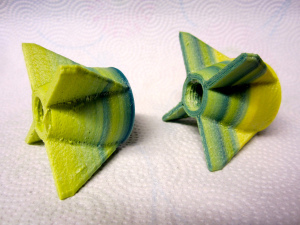 Rich simply uses 618 Nylon together with Tie-Dye colors in order to create his multicolour spool, but the result of mixing different colors on after another into an extruder is potentially the same. Rich’s whole process is a bit more cumbersome however and you will need to source quite some materials in order to obtain these stunning results. 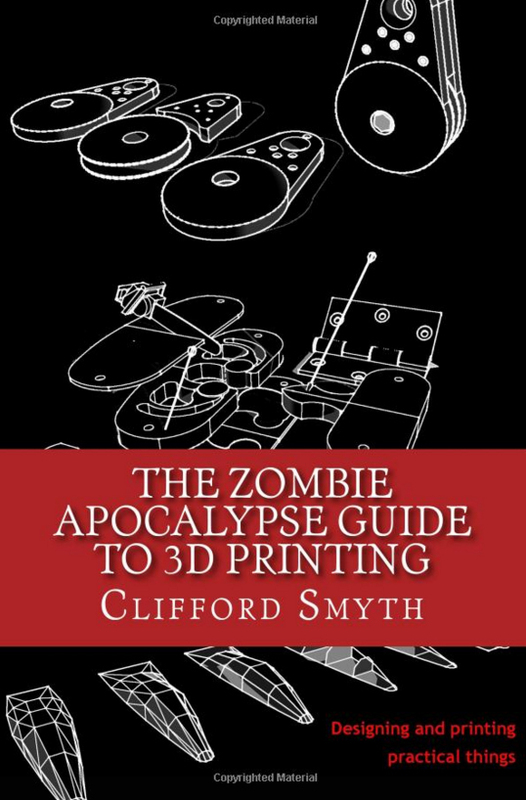 More information can be found here: http://richrap.blogspot.co.uk/2013/04/3d-printing-with-nylon-618-filament-in.html. Let’s have a quick look at the filament production process. 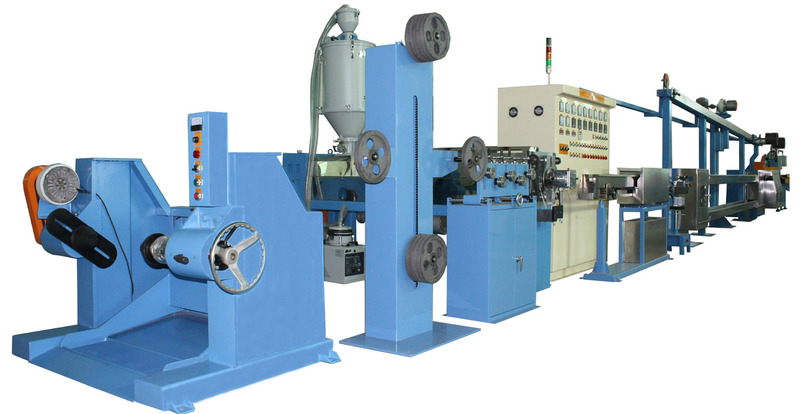 Industrial filament producers usually use large filament extrusion lines, which are big industrial machines which extrude multiple filament strands in one batch and with very consistent diameters, but which are also capable of extruding huge quantities of filament per hour. They heat up very large quantities of raw pellets together with pre-defined color masterbatches (in order to obtain color consistency, producers use pre-defined ratios, as determined by their own R&D). But the core of the production process for these industrial extrusion lines is pretty much the same as the production process for your extruder at home. Have a look at Illustration 17 below, summarising the industrial core production process. Normally, the industrial extrusion lines look more like photos 18 and 19. Some notable differences are that your extruded DIY filament is probably not water-cooled immediately after extrusion, that your home extruder can only extrude a single filament strand and therefore can only provide relatively small quantities of filament per hour, while industrial lines can extrude many hundred kilograms per hour. Also, a home extruder may or may not be fitted with a filament winder, i.e. a machine which winds the extruded filament automatically onto rolls or spools. Apart from controlling filament tension, some winders also implement an automatic quality control of the filament diameter, as unregularly extruded filament results in filament diameter changes, which in their turn affect the quality of your prints. But the most important question probably is: what does it cost to produce a kilogram of homemade filament? Well, to begin with, you cannot compare your home extrusion cost to those of an industrial production, for obvious reasons. As for any industrial process, filament extrusion is submitted to the rules of economies of scale. Hence, the more an industrial producer can buy in big quantities, the more his prices for raw materials will lower. These rules cannot be applied to the very small quantities bought by one single individual, who wants to extrude a few spools for personal use. The prices presented hereafter are therefore just indicative, especially as filament extrusion by private persons is quite a new domain and close to no retail operations are in existence yet. Most of the companies selling pellets and masterbatches are wholesalers, and most do operate with minimum quantity orders of 10-25 kg or more. Although recently, some smart people have identified the potential market which seems to be developing and started selling raw materials in smaller quantities. Finding a reliable supplier providing quality material in retail quantities and for acceptable prices remains a challenge still. By the way, we are currently compiling a list of reliable suppliers dealing in retail quantities for pellets and masterbatches. If you have ordered those and are happy with the materials and their service, please drop us a mail at info[at]3dprintingforbeginners.com. We will publish this list on our site. As of this writing (May 2014), a kilogram of raw resin pellets costs around 3,5 to 4 Euro. Color masterbatches cost around 1,2 to 3,5 Euro per kilogram and very often are only available in bigger quantities (5-10 kg or more). Please remember that these are indicative wholesale prices. Take into account the prices and factor in electricity used for extruding, machine price, machine usage and depreciation, as well as diverse sundries, you may be able to produce your kilogram of filament for around 5-7 Euro. That is a whopping 70% saving compared to retail prices. So, if you only take filament cost into account, getting your own filament extruder might be an option worth considering. Admittedly, you need to print a lot before you can get even, as the extruders available nowadays are not cheap. If you are looking to acquire an extruder, we have compiled a list of commercially available machines for home extrusion, together with their prices. Have a glance at the table below. 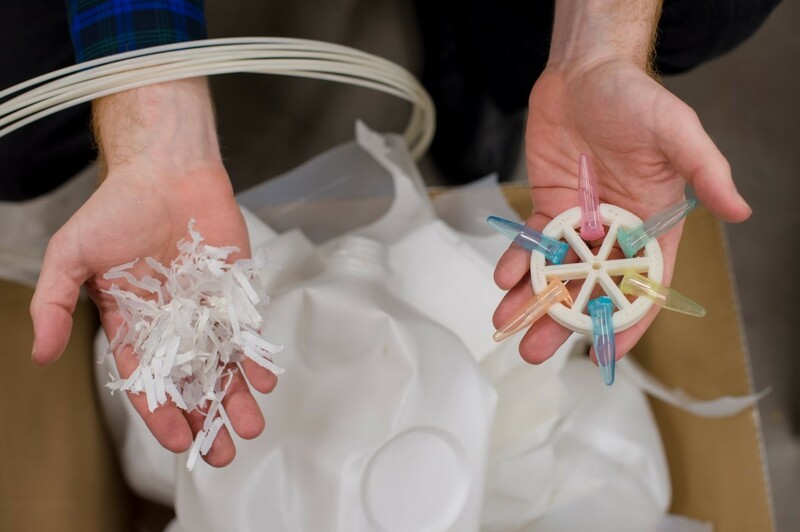 But apart price, the very exciting, often overlooked and underestimated part of having a filament extruder at home is that it effectively can help close the loop on plastic waste. Your home extruder enables you not only to recycle and make filament out of certain plastics, but to effectively re-use them (after some basic processing) in your prints. 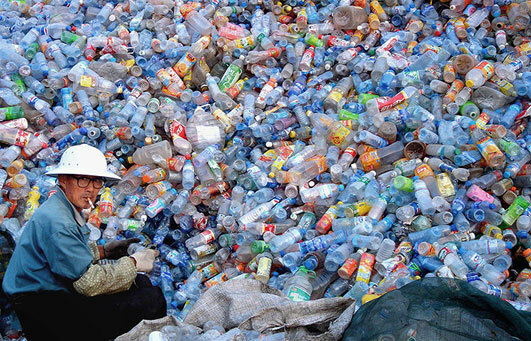 In 2011, worldwide plastics production amounted to around 280 million tonnes (source: http://www.plasticseurope.org/information-centre/press-releases/press-releases-2012/first-estimates-suggest-around-4-increase-in-plastics-global-production-from-2010.aspx)! 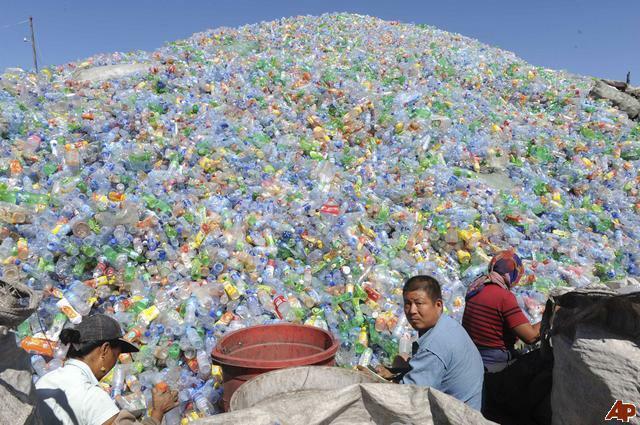 Although the recycling efforts are improving continuously, plastics constitute an enormous environmental problem (just look at landfills or whole plastic islands floating on the sea, endangering wildlife, etc. ), as most of it is thrown away after its intended use. 3D printing in conjunction with plastic extrusion at home may change this. No, we are not writing that recycling and 3D printing these plastics will change the world, as some do claim. But we are convinced that 3D printing and waste plastic extrusion may make a dent in this useless waste system, as soon as the bigger masses will recognize that this “waste” can be usefully re-used for other purposes. Just take the case of a bottle most of us know: the plastic milk bottle (if you don’t have plastic milk bottles in your region, just imagine a water bottle or a shampoo bottle). Most of these bottles are made out of HDPE, i.e. High Density Polyethylene. They are marked with the number 2, according to the Resin Identification Code, which is a set of symbols placed on plastics to identify what type of plastic the item is made of. Usually, these bottles are simply thrown away after use. If you are environmentally conscious, you do recycle these waste plastics. But if you have an extruder and a 3D printer, you should keep the bottles as you can re-use them in order to create your own filament. So, how does reclaiming waste plastic work in practice? After having checked that your bottle is marked HDPE (or PE-HD or stamped with the number 2), you should thoroughly clean it so that none of its initial contents remain. Also, take off stickers, prices or imprints on the bottle. Then, you need to cut the bottle into small pieces, which are then put through a sort of shredder, grinder or similar machine (like Markus Thymark’s DIY Mini shredder) , in order to cut them into pieces that can fit into your extruder. 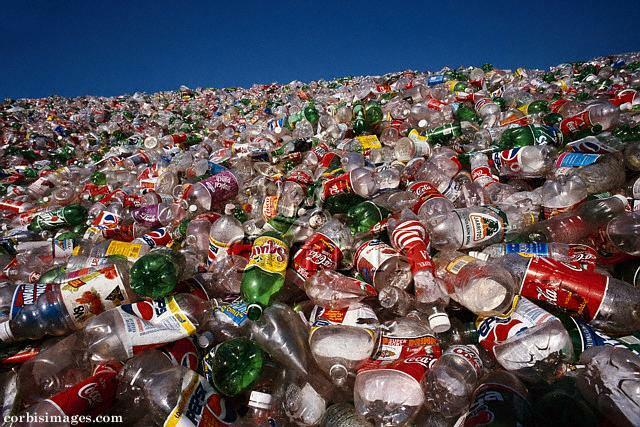 The entire preparation process of the waste plastic bottle is pictured in Illustration 21 below. Usually, the pieces should be consistently around 5 by 5mm, so that the auger or drill can transport the shredded pieces to the heat chamber of the extruder. Dimension consistency of the recycled and shredded plastic pieces helps to avoid diameter variations on the extruded filament. Once the shredded plastic pieces are fine enough, they can be fed into the hopper (the conical part used for feeding pellets to the auger/drill) of your extruder. Although this whole preparation process may be more time-consuming than simply using raw resin pellets, the biggest advantage of using waste plastic is cost. Extruding one kilogram of reclaimed waste plastic filament is estimated to cost about 10 dollar cents, [0.1$, 0,07 Euro, 0.05£] according to Dr Joshua Pierce of Michigan University. Now, this very cheap filament represents a huge economy compared to retail filament! And you have the added advantage that you use plastic which normally would have been thrown away. This definitely sheds a new light on waste plastics, which can now be used to be transformed into something useful, instead of becoming a nuisance as well as an environmental problem. The potential of this development has also been identified by the founders of a charity, called the Ethical Filament Foundation. We have recently assisted a keynote presentation by its founder and will post a more detailed article on this notable project very soon. To understand the huge potential behind this, just check out the Dremelfuge printed by Dr Pierce’s team (photo 22) using plastics from discarded milk bottles. The Dremelfuge (http://www.thingiverse.com/thing:1483) itself is an incredibly useful item and can be used in laboratories as a rotor for centrifuging standard Microcentrifuge tubes (standard 1,5 or 2ml Eppendorf tubes or similar). This 3D printable item, together with the widely available Dremel powerdrill/multitool, can be transformed into a semi-professional centrifuge (centrifuges are necessary for DNA extraction), which would otherwise cost you a minimum of 300-500$! Especially if you consider that you can spin up tp 33000 rpm with the Dremel on full power, which means that you can have a so-called “Ultra-centrifuge” in your garage. This solution enables on one hand people to give a try at “DIY biology research” without having to invest a lot of money into expensive machinery, especially if they just want to tinker around a bit. On the other hand and more importantly, in certain regions of the world where these technologies are not yet available due to different reasons (high cost, lack of infrastructure, technology restrictions, etc.) people are, through these developments, enabled to do conduct DNA research. Just think of the possibilities opening up in developing countries which are often sitting on huge amounts of waste plastics. The future prospects of re-using waste plastics are therefore very interesting, even if we are still in the beginning of this exciting development. Admittedly, extruding waste plastics and printing them is not easy yet and still involves DIY and a serious amount of tinkering, i.e. the process is still far from perfect. For instance, printing HDPE can prove to be challenging on a 3D printer, as you need a heated bed and even may need a heat chamber on your 3D printer, in order to avoid warping. Also, it is important to know that a plastic cannot be recycled and re-extruded over and over again, as it becomes brittle and begins to exhibit structural problems if re-heated too many times. 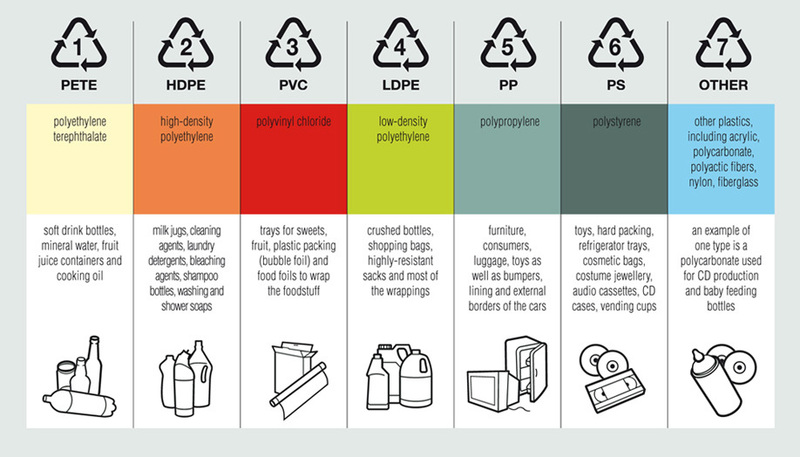 You will need to keep an eye on your plastics “heat history“, as each heat cycle further breaks the polymer chains which constitute your thermoplastic materials. It is therefore recommended that you always mix some new pellets or new plastic shredding among the old mixtures during extrusion, in order to maintain material strength. Another thing to look out for are contaminants, like dust, dirt or different materials which should not get into your print or your extruder. A good extruder should therefore always be equipped with a nozzle integrating a so-called “melt-filter“, which is similar to a piece of very fine wire mesh, excluding those contaminants to get into your filament. This conveniently avoids blocked printer hot-ends which can become expensive! Our example of re-using waste plastics is specifically about re-using HDPE plastics. 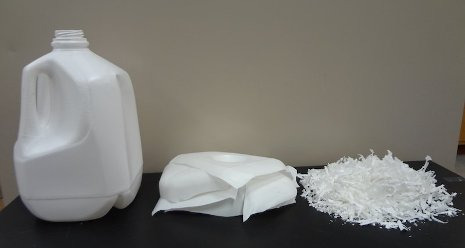 However, other recyclable polymers could also be used for extrusion. But this is where one needs to be very careful, as some plastic types like PVC or other chlorine based polymers can emit dangerous fumes which can seriously endanger one’s health. If you are experimenting with waste plastic extrusion, you need to know what you are doing! Read your material safety data sheet if available! Currently, there only are a few commercial desktop-type extruders enabling you to extrude filament at home. For our reader’s convenience, we have compiled a short list of models currently available, together with some of their most important specifications. FilaFab N/A 220V Yes, but N/A if included. Concerning extrusion speeds, producers either indicate weight per hour or meters per hour. For a better understanding, you can consider that a one kilo spool of 3mm PLA contains +/- 110 meters and while a one kilo spool of 3mm ABS contains +/- 130 meters of filament. For 1,75mm spools, you should count +/- 330 meters for PLA and +/- 400 meters for ABS. Please note that these values are likely to change, depending on the density of the filament your are using. We have contacted the developers of the Noztek Pro, as this extruder represents, in our opinion, one of the most promising designs in all of the existing commercial extruders available today. 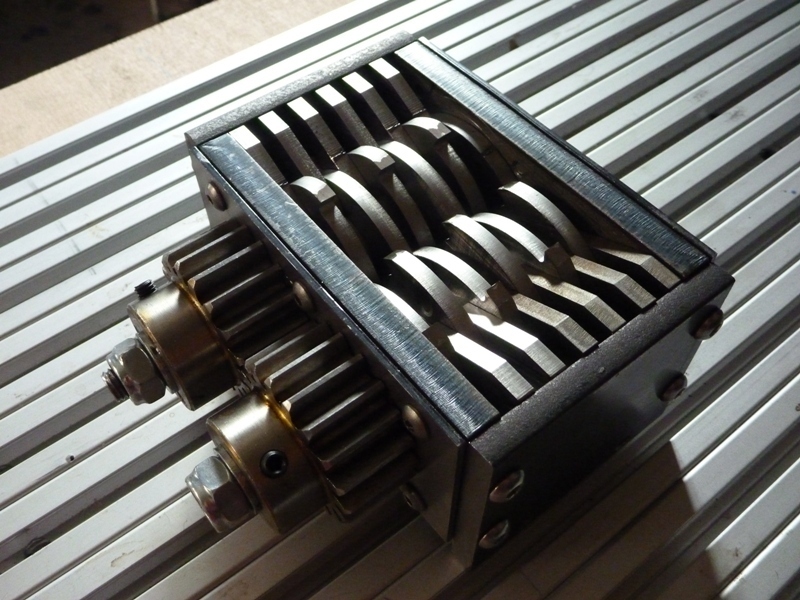 Not only does it come readily assembled, but it also is among the least expensive extruders of its class. Nevertheless it has got all the necessary bells and whistles: interchangeable dies, an included melt filter, a cool-down mechanism via an integrated vent and a high torque planetary motor. Extrusion tolerance is around 0.04mm according to Noztek. Were it comes to extrusion speed, the Noztek seems to be able to extrude 1kg in 3 to 4 hours. And as a special goodie, the guys from Noztek add a free 500g ABS pellets pack. Typically, the Noztek Pro can be used for extruding ABS and PLA, but the guys from Noztek told us that extruding HDPE is also no problem at all. Not only does it have a melt temperature of 180°C, but it does produce good quality filament and presents the advantage of being able to recycle waste household plastics and turn them into something functional. Colors also seem to mix well in that regard. Concerning fumes, we were told that actual fumes released are not much more that those produced by a 3D printer. But Noztek recommends using the extruder in a well ventilated area. The extruder does not come with a shredder or a filament winder. The latter is sold separately on Noztek’s website for 295£. The guys from Noztek promised us a test unit, so we will keep you posted on any further developments, as we will publish our findings on the site. So check back regularly. Thanks for the feedback! Good to hear that you found the info useful. Thanks for letting us know about the extrusion speeds. We initially posted the values which were published on the site of Extrusionbot. Those have been adapted now, as you correctly mentioned. I have edited the table, in order to reflect the correct values. Thanks for your much appreciated feedback. If there is anything else, please let me know. I tried to like you on facebook so I could download the PDF about making my own filament but it won’t let me like you. Sorry about this, not sure what went wrong. In any case, I have just emailed you the PDF. Happy reading! Appreciate the feedback! Check back regularly to get the latest content. Thanks for your kind comment. Check back regularly if you wish to find out more about 3D printing. Could you please share what motor to use? capacity, torque? Sorry, but I do not have any specific information regarding those motors. I would advise that you contact the manufacturers of the filament extruders featured in the article. 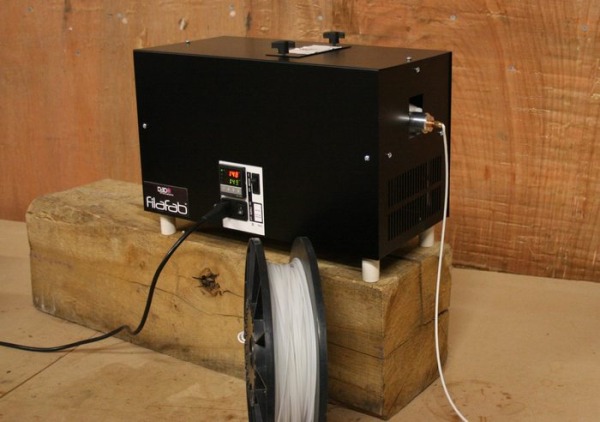 Do you have the cad files of the filament extruder? Sorry, I do not have any CAD files for the extruder. I advise that you try and contact the manufacturer of the extruder with your request. Could you make a review about it? Thanks for letting us know about Filamake, we haven’t heard about them before. We have planned to do a review of extruders soon, we’ll keep Filamake in mind when setting this up. How many spools of filaments can be obtained from 1 kg resin pellet? Well, with one kg of pellets, you will be able to make about one kilogram of filament. Normally, there should be close to no material loss during the extrusion process, but you may loose some material while trying to dial in your filament extruder. If you are coloring your filament yourself, you will add very small amounts of masterbatch pellets to the mix, but those should make no difference in the total amount extruded. One standard spool of filament normally wheighs about 750 grams, some spools wheigh about a kilo. So you can calculate that with a kilogram of pellets, you can extrude between one to one and a quarter spools of filament, mainly depending on the spool size you are using. Hope that helps. I am not sure what screw you are exactly talking about, but I am guessing you want to look into the “hobbed” bolt driving the filament. The materials those knurled bolts are made out of can be quite diverse: brass, aluminum, composites, etc. He actually shows you how to make those bolts yourself. Hi, I found another filament extruder named Felfil Evo, it looks good. Hi guys , this is ratna. i have been making my own filaments with Extruder. How to maintain the uniform diameter through out the process. Because , I tried to make a 3D model with strands which i maid the diameter of min 1.6 mm to max 1.75 mm. It observed that, Nozzle has got choked every 2min once. please any one suggest what could be reasons and how to overcome it. Maintaining a uniform diameter in filament extrusion is about the most difficult aspect of DIY extrusion. Could you tell me what kind of extruder you are using – DIY or a commercially bought one? Also, what materials are you using for your extrusion? Commercially bought pellets or recycled filaments you shredded yourself? In order to obtain a perfect extrusion, you must make sure the the materials being forwarded by your auger (i.e. the main screw) are of the same size and consistency. The heat on the mozzle should also not fluctuate, as it is sometimes the case with DIY models. A lot of it also depends on your setup, like do you use water cooling or air cooling after the filament passes the nozzle? I will need more information in order to be able to help you further. Is it possible to use wax to make a wax filament for casting? There actually do already exist some wax filaments for lost wax casting. Has anyone heard about http://www.preciousplastic.com The owner of the website made open-source DIY extruder. Can anyone please review it? Can DIY extruder make market standard filament? Thanks for that interesting link, as I did not know those guys and their project yet. 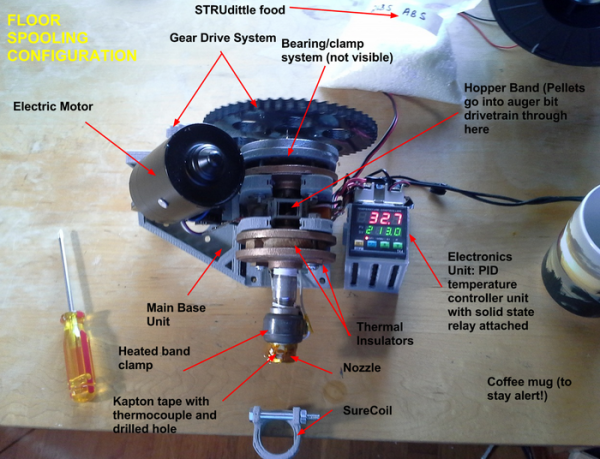 As for reviewing their extruder, you would first have to build one before being able to review it. Me, for my part, I just have too many things still in the pipeline, before I could actually consider such a time-consuming project. Anyway, you are not obliged to use that specific model, as there are many DIY filament extruders out there. It may have been some time since I wrote that article, but most of my references in the article are still valid.